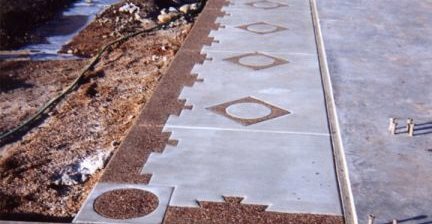 For decades, pattern stamping and exposed aggregate have been popular methods for adorning concrete surfaces. Now theres a simple design technique that marries the two looks, and multiplies the "wow" factor. 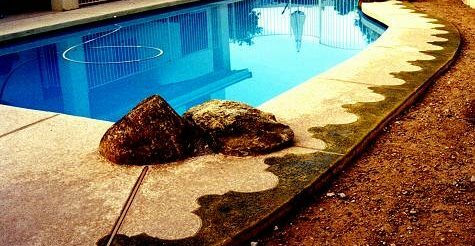 Just one look at the stunning results will make it clear why this new approach to decorative concrete is catching the attention of contractors, architects, homeowners, and municipalities alike. The secret behind the process is the Concrafter design stamp, a reusable polyurethane imprinting tool that produces distinctive patterned borders and insets on a monolithic slab, without the need for a separate pour. 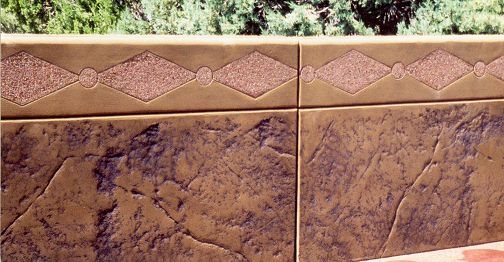 The inventor, Theo Hunsaker, has been a concrete contractor for more than 50 years and often dabbles in decorative work. He worked from 2-inch templates to develop his innovative design concept, for which a patent is pending. He credits his sons Kip and Sean, who he calls "concrete specialists," for helping him develop the tools and their many patterns. The trio introduced the stamps at World of Concrete 2000, and now sells them worldwide to other concrete contractors who want to offer customers a look thats totally unique. "Because of the way the tools are made, you can place them at different angles or facing away from one another. You can also combine different patterns to create endless designs," says Hunsaker. 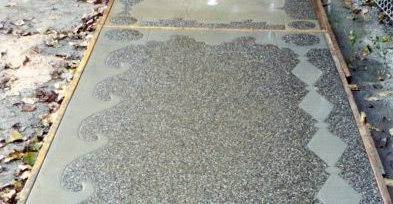 Although the patterned borders alone produce an ornate motif, many contractors choose to add extra flair by exposing the aggregate in select areas of the pattern. Further accents are possible by incorporating color into the design. 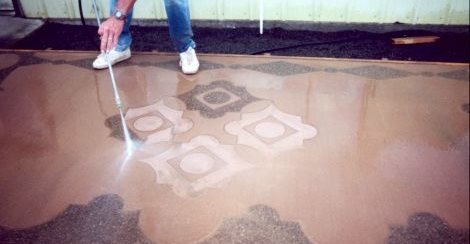 Options include stamping the pattern in integrally colored concrete, applying stains to highlight the patterned areas, or using a combination of both methods. Despite the intricacy of the results, working with the stamps is not complicated, says Hunsaker. "Theres no magic to it. You dont have to measure anything." Using measurement guides on each edge of the stamp, contractors can choose how wide they want the border design to be, ranging from 2 to 18 inches. The guides keep the border uniform by following the inside of the form edge, whether the form is linear, angled, or on a radius. If aggregate exposure is desired, a surface retardant is spread on the areas to be exposed right after the design is imprinted in the wet concrete. Hunsaker recommends the use of a special surface retardant his company developed for architectural purposes. "It has a thicker consistency, so it stays where you put it," he says. The product is also colored, allowing applicators to see which areas theyve treated so they dont miss any spots. In addition to the border stamps, which are currently available in 11 different patterns, Concrafter offers 24 stand-alone patterns for stamping insets or corner medallions. Hunsaker explains that the inset or corner stamps can be used alone, as a point of interest, or to complement the border designs. Concrafter also produces custom stamps for special applicationsranging from corporate logos to entire scenescapes. 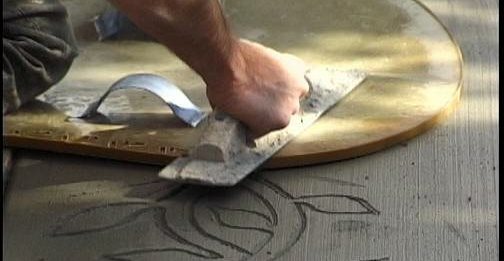 Although the stamps are most commonly used to dress up concrete flatwork, they have many other applications, including concrete countertops, tilt-up walls, fencing, and signs. They can also imprint patterns in overlays, stucco, or plaster. To introduce contractors to the myriad design options possible with the stamps, Concrafter provides an instructional video with its tools and conducts seminars across the U.S. and Canada. "We plan to give 40 seminars in 2003. We will travel around the country to conduct the classes in various states," says Hunsaker. Contractors will be able to enroll in these classes at World of Concrete in February, where Concrafter will have a display of its tools. Anne Balogh writes feature articles each month for The Concrete Network. She is a freelance writer based in Glen Ellyn, Ill., and a former editor of Concrete Construction magazine. More about Concrete Patio Designs.